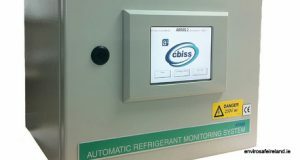 Under the current F-Gas Regulation Automated Refrigerant Monitoring is mandatory for sites with an overall refrigerant charge in excess of 300kg to install a fixed refrigerant leak detection system. Leak detection for F-Gas compliance can be achieved with a fixed gas leak detection system from a1-cbiss. The ARMS 2, a fixed refrigerant gas leak detection system with an established reputation, is based on proven gas detection technologies with enhanced features and benefits configured to meet the specific requirements of the F-Gas Regulation. The ARMS 2 utilises multi-gas infrared sensor technology and can be supplied as an 8, 16, 24 or 32 channels model, to provide wide area leak detection for the simultaneous measurement of multiple gases. In addition to these features, the system also features a range of flexible I/O options as standard and fully configurable settings, accessed via the touch screen display.